The Bharatiya Janata Party (BJP) on Monday released its manifesto, or a Sankalp Patra as the party calls it. The Sankalp Patra has made some interesting changes to the party’s 2014 manifesto. 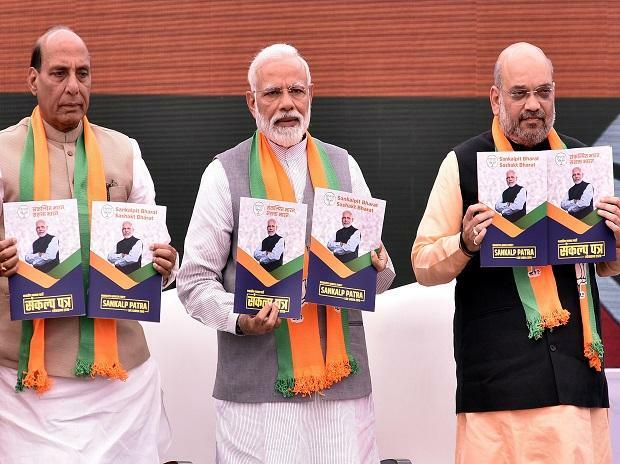 The cover of the 2014 manifesto had pictures of all its prominent leaders — Atal Bihari Vajpayee, L K Advani, Murli Manohar Joshi and Rajnath Singh — on one side, and Narendra Modi depicted as first among equals along with leaders such as Vasundhara Raje, Raman Singh, Shivraj Singh Chouhan, Arun Jaitley, Manohar Parrikar and Sushma Swaraj. The 2019 manifesto has only the picture of Prime Minister Modi on its cover page. During the 2014 Lok Sabha polls, Narendra Modi and Rajnath Singh, who was the party chief then, were projected as the BJP’s ‘jodi number 1’, particularly in Singh’s home state of Uttar Pradesh. In the next five years, in most party events where Modi and current party chief Amit Shah spoke, it was rare for other leaders to speak. Monday’s manifesto-unveiling event marked a departure from this rule. Those who spoke included Singh, who headed the manifesto-drafting committee, besides other senior leaders like Sushma Swaraj and Arun Jaitley. Only Nitin Gadkari was missing as he was busy campaigning. The BJP manifesto- unveiling event had its share of bloopers — the document itself had a mistake. At the launch, party leader Bhupender Yadav (pictured) introduced Arun Jaitley as home minister of the country. He corrected himself and introduced Jaitley again as finance minister when journalists present pointed out the mistake. In the section titled "education for all" in the manifesto, the party has recognised the "yeoman service" rendered by the Kendriya "Vidyalalas". The misprint led Congress social media teams to accuse the BJP of showing its "unflinching commitment to privatisation of education". "They will convert 'Vidyalayas' to Vidya for Lalas," a Congress functionary tweeted with the hashtag BJP jumla manifesto.